People new to 3D printing may not understand what supports are or why they are needed. Essentially supports are wasted material that are broken away after completion of a print. 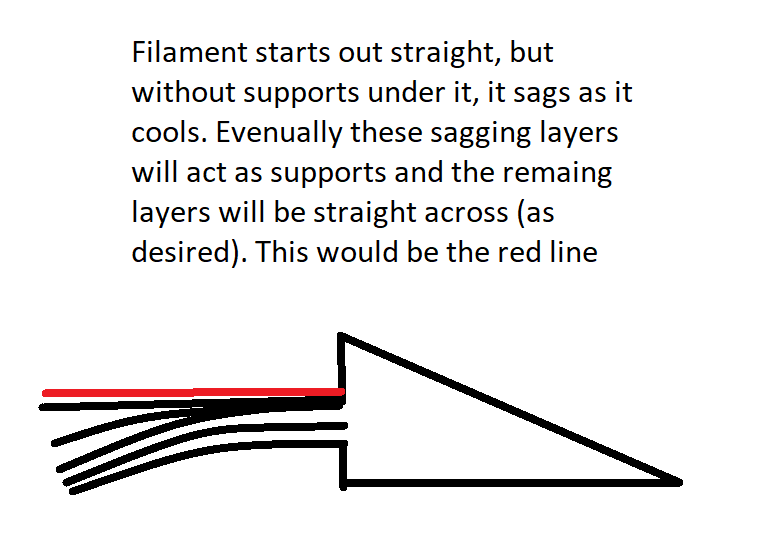 Without supports, the plastic will sag as it moves across an open area. It’s best to explain with an example. In the Figure 1, you see 2 parts. The parts were printed in the direction of the arrow. Part 1 was made with supports. As a result, the bottom surface came out correctly. Part 2 was missing supports on the edges only. What happens is that the bottom layers of this area essentially sag as the printer tries to put down plastic in that region. Figure 2 shows a sketch of what is happening. 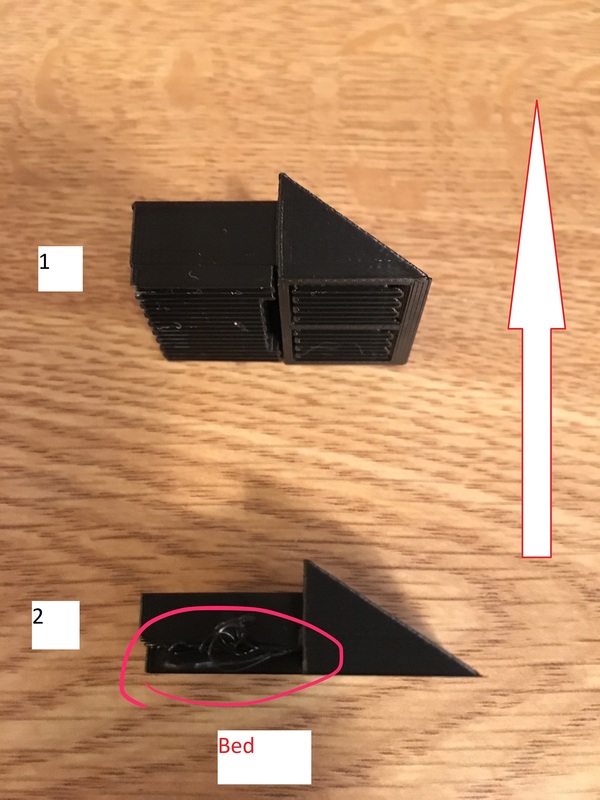 So what did I do wrong in this case (since I should know better that I need supports)? 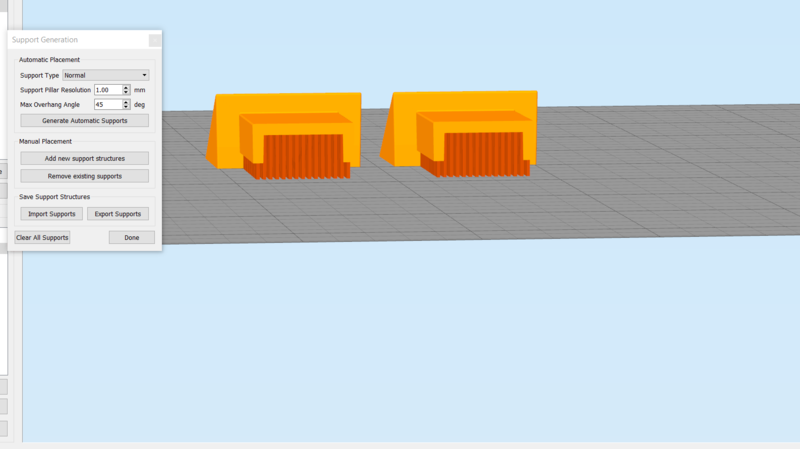 I set up my prints in Simplify3D, and you can choose the support resolution. Support resolution is basically the how small of an area supports will generate. The outer edge of this part is less than 2mm and I originally had the resolution chosen at 2mm. Therefore it would not auto generate. Once I changed the support resolution to 1mm, this problem was solved. See Figure 3. The supports are the red bars. PreviousPrevious post:3D print The Future TV Show UpdateNextNext post:How does a Form2 3D printer compare to an Ultimaker2+? What is the failure rate and how much maintenance is needed?